More than 1,400 Special Olympics Kentucky athletes will celebrate 25 years of competition at Eastern Kentucky University, when Special Olympics Kentucky returns to its home away from home for the 2019 State Summer Games. This year the Summer Games will be held on the Richmond campus from May 31-June 2. Athletes will be competing in five sports — track and field, swimming, bocce, rhythmic gymnastics and soccer at the Games. Summer Games activities get underway early on May 31 in the Capitol Rotunda in Frankfort with the opening of the Law Enforcement Torch Run Final Leg at 9 am. The Final Leg group will then head to the Capitol steps for the lighting of the Special Olympics Torch, which the Final Leg participants will then carry to Richmond for the Summer Games Opening Ceremonies. Opening Ceremonies for the Games will begin at 7 pm on May 31 in The Ravine near the center of the EKU campus (weather permitting). The Ceremonies will include the parade of athletes and the lighting of the Special Olympics cauldron. In the event of bad weather, the Opening Ceremonies will be held in Alumni Coliseum. Competition will begin Friday night immediately following the Opening Ceremonies. Tom Samuels Track will host the distance races and relays beginning at approximately 8:20 pm. There will also be several heats of the shot put competition held on Friday night. The Don Combs Natatorium will also see aquatics action on Friday night, beginning at 8:30 with the short course relay events. The main action gets underway early in the morning on Saturday, June 1, with the opening of all remaining competitive events. Athletes will be competing in track and field, swimming, bocce, soccer and rhythmic gymnastics. The public is encouraged to attend the Opening Ceremonies and all competitions. All are open to the public and there is no admission charge. Most competitions on Saturday will be underway by 9:00 am. 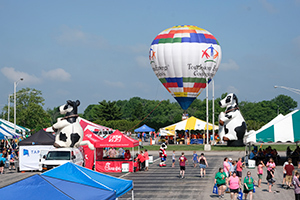 Saturday’s activities will also include the popular Chick-fil-A Olympic Town area, which includes several interactive activities for athletes and their families. Chick-fil-A Olympic Town is also the location of the annual Healthy Athletes Athlete Wellness Village. This year’s Healthy Athletes program features a Special Smiles location where athletes can receive dental screenings; an Opening Eyes vision screening venue; a Fit Feet location where athletes can receive podiatric evaluations; FUN Fitness, which gives physical therapy evaluations; Health Promotions, which offers advice on diet and other healthy lifestyles; and the latest addition, Strong Minds, a program focused on developing adaptive coping skills. All of the services provided in the Healthy Athlete Village are free to the athletes and provided by volunteers. Several area hotels offer discounted rates to people attending the Summer Games. Photos from all competitions and other Summer Games activities will be available on line throughout the day at flickr.com/photos/sokentucky/albums. Photos will be downloadable and can be used for publication. Saturday’s activities conclude with the official Closing Ceremonies, which begin at 7:30 pm in the Alumni Coliseum parking lot. Closing ceremonies include the presentation of the pentathlon medals, fireworks and an athlete victory dance. Volunteers are still needed for several venues at the Games. For volunteer opportunities, contact Kelli Firquin at 800-633-7403 or kfirquin@soky.org. This is the seventh consecutive year that Kentucky’s Touchstone Energy Cooperatives has served as the Platinum Sponsor for the Games. 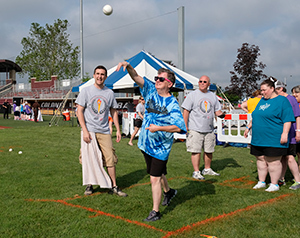 Touchstone Energy is the largest single supporter of the State Summer Games. This will be the fourth year that Chick-fil-A Central Kentucky stores are teaming up to provide all lunches for athletes, coaches and volunteers on Saturday, June 1. For information about the 2019 Special Olympics Kentucky State Summer Games, contact Special Olympics Kentucky President/CEO Trish Mazzoni at 502-695-8222 or via e-mail at tmazzoni@soky.org. 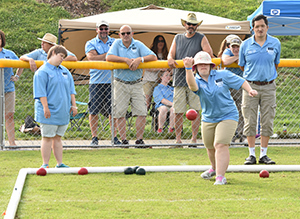 The 2019 Special Olympics Kentucky State Summer Games are made possible through the generosity of platinum sponsor Kentucky’s Touchstone Energy Cooperatives, Special Olympics Kentucky year-round partners Texas Roadhouse and Toyota; Gold Olympic Town sponsor Chick-fil-A; Gold Sponsors AECOM, Eastern Kentucky University, the Law Enforcement Torch Run for Special Olympics Kentucky and Walmart; Silver Sponsors Richmond Tourism and Southland Dairy Farmers; Bronze Sponsors Golden Corral, Don Jacobs Honda-BMW-Volkswagen, Greentree Forest Products, Lockheed Martin, Penske Truck Rental and People’s Bank and games sponsors the City of Richmond, Dever Golf Cars, and Positively Java.